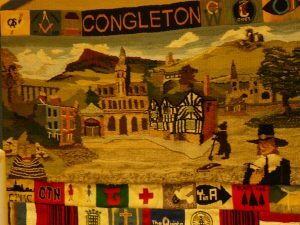 Congleton Museum Pub Quiz – Save the Date! Following the success of last year’s pub quiz, Congleton Museum is pleased to announce that we will be holding another quiz on the evening of Sunday 12th April at The Young Pretender, Congleton. Tickets will cost £10 each (£8 each for Friends of Congleton Museum); included in the price is your choice of a delicious pie supper. There will also be an option to join in on the night, without supper, for £2. Teams and individual entrants are most welcome, and it would be great for local businesses to get involved too. Last year’s quiz was hugely popular with a total of ten teams taking part and over £350 being raised for the museum – a fantastic achievement, which we hope to match again this year. So if you want to test your general knowledge and support the museum at the same time, then come and join us for what promises to be an excellent evening. A prize for the winning team will also be up for grabs! To book, please email info@congletonmuseum.com and we will get back to you with further information. Congleton Rotary Club has been very generous in the New Year with their support of the Bradshaw House move – donating a grand £1000 to the fundraising efforts. Read the full article in the Congleton Chronicle. 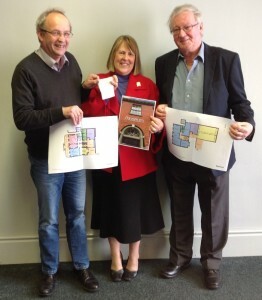 Ian Doughty, Fiona Bruce MP and Mike Warke with the exciting plans for the museum’s proposed move to Bradshaw House on Lawton Street. For further information about the move and to see what our new home will look like, please click here. We’d also love to know your thoughts regarding the museum’s future so please take a few moments to complete our questionnaire by clicking here. Congleton Museum is in the process of raising funds for its proposed move to Bradshaw House – one of the town’s most historic buildings. Paul Birch of Birch Jewellers, located on Bridge Street, is the first local business to provide his support. Paul will buy your unwanted gold or silver items and will donate all monies received to the museum. So hunt out that broken jewellery that you never wear and head to Birch Jewellers to show your support! 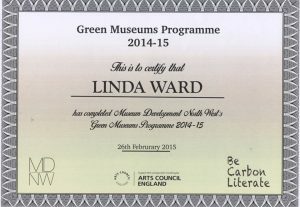 Alternatively, your unwanted items can also be handed in at the museum. 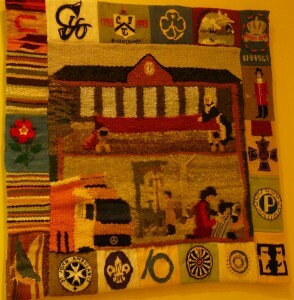 Donors can also donate the cost of their unwanted items to the museum directly and gift aid the amount too. 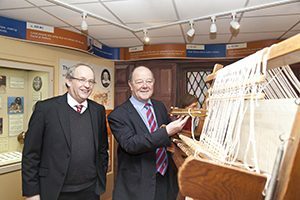 In addition, Paul has kindly offered to dedicate a display shelf in his shop to the museum. He will use this to display more expensive items of jewellery which will be sold individually. After deducting expenses (e.g. 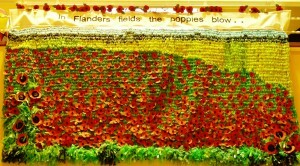 credit card costs) and a small commission, he will pay all proceeds of these sales to the museum. To date the museum has raised over £4,000 and is on track to reach its target of £10,000. 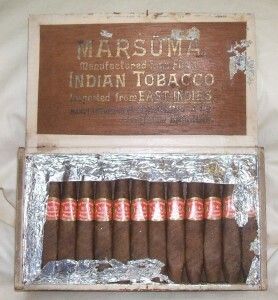 Further pledges for donations have been received and inventive plans are being suggested. These include second hand book and craft sales, a line of silver coins stretching from the museum’s existing site round to Bradshaw House, boxes to collect small change, as well as coffee mornings and home made cakes. All donations will finance the initial phase of surveys and design work, which are required before the grant applications can proceed. 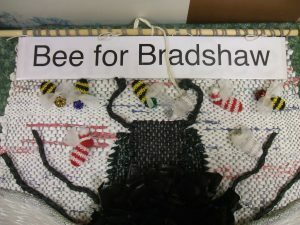 Christmas Bradshaw Bees are now available! With little Santa hats, tinsel in their hair, and silver stripes, these bees would make perfect Christmas decorations. Donate to the Bradshaw House fund today and get your bee. At least £1 donation per bee.